Brave Giant proudly presents the latest from the Demon Hunter series. As a promising young demon hunter, you are prepared to take on adversaries from the underworld, but when an ancient Egyptian artifact shows up on your doorstep heralding the return of Seth, a demon scourge as old as evil itself, you find yourself facing the most dangerous challenge imaginable. The encroaching darkness threatens to swallow all light spanning time itself! Can a mere mortal really hope to contend with such power? Find out in Demon Hunter 4: Riddles of Light Collector's Edition! 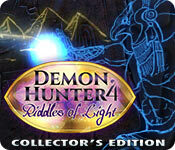 Demon Hunter 4: Riddles of Light Collector's Edition is rated 3.5 out of 5 by 16. Rated 5 out of 5 by blipi69 from Great Game I enjoyed playing this game - I don´t really know what it had to do (regarding the story) with part 1-3 ... but it was the best so far. 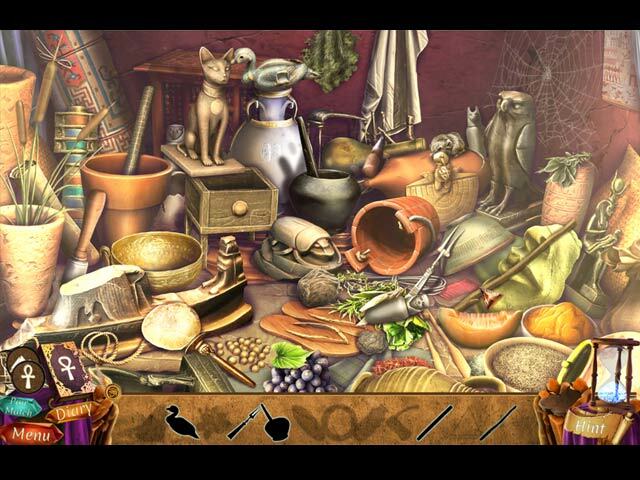 Rated 5 out of 5 by GogaO from Ancient Egypt Game Just enjoyed this game with awesome collection of Ancient Egypt images. Rated 5 out of 5 by Majestyx12 from Breezy Egyptian game Based on the completed game and bonus material. I haven't bought any in this series before. I liked the trial so I bought it. I was very impressed with the accuracy of the Egyptian items. They had the proper wordage for the tools, clothes and animals. They did their research. We all know that some makers haven't even cared enough to proof read or fact check. So I found this a breath of fresh air. I enjoyed this game. It's not perfect but they put in some effort. Most mini-games were the one's I like to play which is relaxed. I found a puzzle that had no hint or skip. It took me a little bit, but I managed it. I'd like for the text to be on screen longer so I could read all of it. I would also like to have a paper recipe or instruction bought up bigger so I can make it out. The hops graphic are on a larger scale that is easy on the eyes. I would call these lovely. Meaning I really loved the illustration. They have some morphing items. They are things already on your get list. I've seen one to three in a hop. They didn't list them in the guide. Which they should. To use the guide you have to go to the menu. You don't stop your game. It's like using the menu for the options. I did like collecting 33 Stars and 4 Diamonds. They have a indicator on the tool bar. It's a Scarab Amulet that glows until you have all the collectibles found in the scene. I didn't miss any but I kept checking to see if I could retrieve a missing star and I don't think you can. You finish the collecting before the bonus chapter. The bonus chapter starts three days before the main game. It has Akiiki in it. The game has a few places that has the main person or bird clear and the background blurred. I think it's to have you play attention to that person or bird. Falcon in bonus. I would of preferred for every thing to be clear. It has 4 Chapters. The guide is 59 pages. I don't know how many pages is good, so I opened another game with 6 chapters. The game starts with Dead R and it had 33 pages. Go figure. The data total for this CE is 669.1mb. I'd call that average length. I counted 17 hops in the main game and 5 in the bonus. That's 22 hops. Now a days, I think thats plentiful. I would recommend this game for hops lovers and not for puzzle lovers who need a challenge to be happy The bonus content has replays of 8 hops, 6 mini-games, 5 music tracks and 6 cut scenes. 12 wallpapers and 12 concept art. Rated 5 out of 5 by rainworm from Fascination of Ancient Egypt This fourth demon hunt will lead you to ancient Egypt. Your opponent will be Seth, the Egyptian god, who threatens the world. It is you, who has been chosen for the task, as you are the Bearer of Light and thereby the only one, able to fight the dark Seth. The mighty gauntlet of Horus is your weapon. But many obstacles lay on your way. First, you have to find the missing pieces for your gauntlet, then, your companion is kidnapped by one of Seth’s demons and you need to go back in time and confront your opponent in Ancient Egypt at his place and time. Dark fantasy storywise and entertaining with a mild challenge and beautiful visuals. Rated 5 out of 5 by sunnyglow from SAVE THE WORLD FROM DARKNESS IN A TIME TRAVELING TREK THROUGH ANCIENT EGYPT 4 Chapters Plus a Bonus Chapter – Strategy Guide: 59 Pages OVERVIEW: Grab your camera and protective amulet as you, Lila, along with your Aunt Dawn travel back in time to Ancient Egypt. You are off to fight an ancient evil, the god Seth! An ancient artifact, the Gauntlet of Horus, has been discovered, one which can defeat the darkness and evil controlled by this Lord of Evil. When your aunt is kidnapped by a demon, you must activate a portal and go back in time to Ancient Egypt to save the world from darkness. You, as the “Bearer of Light” are the only one who can save mankind from the evil machinations of Seth and his demons. This is another fantastic game by Brave Giant. I love this series and have waited for BFG to offer this game on their site. This is an easy-breezy game in which you can gently flow down the Nile without shedding any crocodile tears battling difficult puzzles. This is a fun game which should appeal to those who love archaeology, adventure games, or the thought of time travel to ancient Egypt. The graphics are beautiful and remind me of the old Egyptian mummy movies from Hammer Films. The story is a wonderful action-packed time travel adventure into the distant past. The game has an excellent pace with plenty of activities to keep the player busy. This game was an automatic purchase for me! This is beautifully illustrated fun-filled game to wile away the hours. MECHANICS: You can replay some of the puzzles and HOP scenes. There are twelve (12) wallpapers and twelve (12) concept art scenes. You collect four (4) diamonds and thirty-three (33) stars. I found them easy to locate. There are also morphing objects within the HOP scenes. There are twenty-two achievements to earn as well. The Gauntlet of Horus is your helper throughout the game. You can play a Matching game in lieu of the HOP scenes. HOP SCENES: I feel the HOP scenes are better designed than the puzzles. The scenes within the demo are lists of items and silhouette. One of the silhouette in the demo is a FROG. All are interactive and beautifully illustrated. They are thematic and truly reflect the flavor of Ancient Egypt. The HOP scenes have morphing objects within them. PUZZLES: No crocodiles hiding here! However, you do learn to play the flute while lulling a cobra to leave the scene! Bye- bye! Snake-eyes! The puzzles are easy. I found none which were even slightly difficult. They are thematic as well. They include a jigsaw puzzle placing pieces back into a cartouche. There are two storybook puzzles (which I feel are more like HOP scenes than puzzles) in which you locate and interact with items listed in BOLD letters. Some of the activities I considered puzzles; however, they are not designated as such by the developer. I included them below as puzzles, however. SOCK IT TO THE DEMONS! You play a puzzle every time you need to fight off demons within this game. It is a variation of a bullseye puzzle. You follow a target and when it turns blue, you can click away demolishing those evildoers! HERE ARE THE DETAILS (SPOILERS) FOR THOSE WANT MORE INFORMATION ON THE HOP SCENES AND PUZZLES IN SEQUENCE FROM THE DEMO HOP SCENES: You have the option to play a Matching game in lieu of the scene. (A) Silhouette. Search for items and replace them back within the scene. (B) Locate 12 pebbles. (C) List of items. (D) Silhouette items. (E) Silhouette puzzle - FROG (F) List of items on a hieroglyphic slab. PUZZLES: They are all easy. A. * Demon Fighting Puzzle. Every time you need to fight demons, use the gauntlet. Bullseye puzzle. Take out the demons by following a target. When it turns blue, click on it to fight the demons. B. Jigsaw puzzle. Place fragments of a cartouche into their proper location. (Within the inventory) C. Storybook. Locate items listed in BOLD letters by interacting with the scene. (More of a HOP scene than a puzzle) D. Sequence puzzle. Lull an angry cobra by playing a flute according to a given code. E. Dialogue puzzle. Choose the correct questions to ask from a series of possible questions. F. Slider puzzle. Slide tokens with fire symbols on them so they are in sequence. G. Storybook puzzle. Interact with the scene locating items in BOLD letters. Rated 4 out of 5 by theswede from does horus wamt a cracker I do half to say the Egyptians had a imaginary world good game enjoyed playing it. Rated 3 out of 5 by codfish1 from quite boring. Played for a bit, ok. Then started to get boring. Most of the games now are same old, same old. some bugs i found. instead of HO, did the pairs game. but their was nothing behind any if the discs. just had to pick any and hoped they matched. 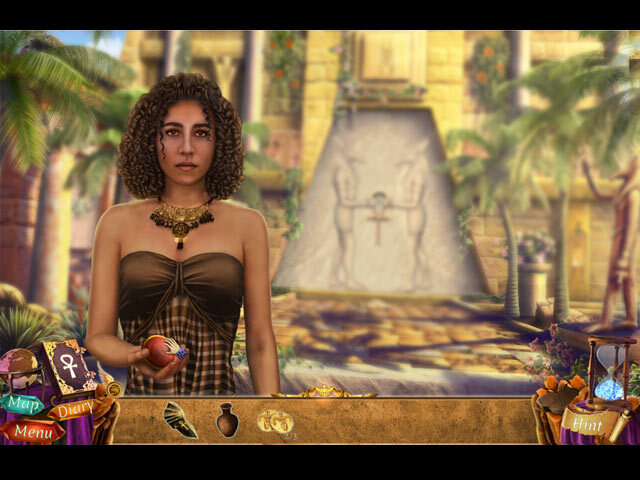 if you are into anciant Egyptian and far fetched story lines then this game is for you. if you are a realist, and want to emerse yourself into actual true desturbing, but pin you to your seat games. then this is NOT for you. Rated 3 out of 5 by Queen_of_Parts from Run of the mill - nothing special I gave up on the demo after 15 minutes, so it may have improved after that, but the pace was so slow and it was very boring, and I didn't want to waste any more of my time on it. I usually play in "custom" mode on these sorts of games, but there was no way to turn off the hint and skip option. The collectibles were far too easy to find, and the puzzles incredibly easy. The storyline has been done so many times. I just didn't find anything new or exciting about the game. It wasn't bad, just not for me..